When I first posted the book, I got tons of congratulations and well-wishes from friends (some of whom I haven’t seen in 20 plus years). My book was Hot & Trending for the first 5 days. It was a bit of a high. I figured I’d be disappointed when it fell from the hot list. And I was, but I didn’t come down like a gutter junkie, strung-out on likes and votes, wishing I could sell my mom’s TV in order to buy another bag of positive affirmations. Then I realized something awful: If my book is not selected, every person who voted will get an email letting them know I lost. What the crap!? How did I overlook this little detail of A MASS EMAIL TELLING EVERYONE I KNOW THAT I’M A FAILURE? Once I started breathing again, I told myself that everyone fails, and there’s nothing to be ashamed of. In fact, I reasoned, I should be proud that I faced my fear and put myself out there. And I began to actually feel proud. Whew, that was close, I thought. Thank god I had the emotional intelligence to pull myself from the edge of that narcissistic spiral. I applied my mascara and got ready to face the day. And I accidentally stabbed myself in the eye with that mascara applicator. I had to go to urgent care and get a special ointment. That night, during a cleaning frenzy aimed at forgetting my cornea pain, I knocked my dog’s giant antler bone onto my foot. My pinky toe is swollen and purple and possibly broken. I guess it worked because I forgot about my eye. The next morning, I wrenched my knee while negotiating the treacherous three-inch drop into the garage. My knee is also swollen and purple. This all happened in the 24 hours after I had that realization about the mass email. A Freudian might say I’m subconsciously inflicting physical pain on myself because I feel like a worthless human being. I don’t know about all that, but I definitely think there’s a connection between my injuries and this campaigning process. Attention, or lack of it, is one of the many things I’m not very good at handling. I’m avoiding knives for now. But I’ll keep shamelessly seeking more votes, even though this could add to the number of people who might end up learning I failed in my endeavor. Because I’ve worked too hard to let my stupid pride stand in my way. Thanks for reading my post, and since we’re on the subject, I’d be so grateful if you’d nominate my book here! UPDATE: CONTEST ENDED--ALL VOTERS RECEIVED THE DREADED EMAIL. You have my vote! I'll be first in line to purchase your book. Most couples have an unspoken contract—we expect that we’ll have each other’s backs, right or wrong. But are there any circumstances in which a spouse should not come to your rescue? Is there ever a good reasonto refuse to tag-in and leave your partner alone in the fighting ring? My husband and I dove into that fun topic the other night. Check out this tangle of thorns: . We were at the movies, which is always a potentially volatile situation for me. 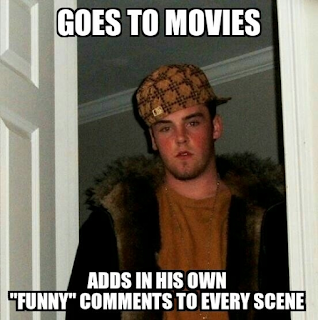 If anything distracts from the screen, I can’t enjoy the movie, no matter how good it is. Had I been seated next to an occasional throat-clearer during Forrest Gump, I would have shrugged my shoulders and said to my date, “Meh. That was okay, I guess,” as the credits rolled.